This is the fifth in a series of posts about running a successful fundraising event night, written by event service professionals. Event service professionals help troubleshoot technology, advise on using event software, and ensure everything goes as smoothly as possible at auctions. Professional event services consultants like me, working the front lines of fundraising events, have witnessed first-hand how mobile technology is radically altering the auction landscape. It’s progressing so fast that what was considered a high-tech auction tech a decade ago isn’t even close to what we see today. It did take some time for great ideas like using smartphones and iPads at events to take off. Bidding via text message, for example, existed for years before a lot of events adopted it. Even then, the idea of bidding from a mobile device didn’t really take off until the smartphone became widely available, and the idea of bidding from a mobile device moved from texting bids to entire bidding apps. Now, there’s enough software support for these technologies to be easy and effective to use, making the potential for a huge difference in how much money you can make with it—and giving a big boost to guest enjoyment. Given the prominence of mobile tech solutions at events, we decided to collect all of our tips and tricks in one place. Here are some ideas for using these tools to run your event faster, smoother, and give attendees an experience they won’t forget. 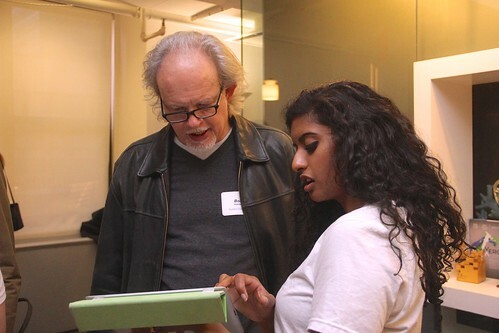 Tablets (such as iPads) make a great addition to any nonprofit event. They give volunteers tons of flexibility to move through crowds, pick off people who have been waiting a long time, or even just sell things on the spur of the moment. Tablets are the do-everything addition that can really take an event to the next level of service, convenience, and style. 1. Give volunteers tablets, and set them up at registration to provide guests with a concierge-type experience. Have these volunteers pick off guests one-by-one to register as they arrive, or go through the line helping people who have been waiting longest. HINT: Consider placing your volunteers at high-top, round cocktail tables (like this organization did), for an added level of ease and comfort for your guests. Long lines at registration will soon be a thing of the past! 2. Bring in tablets at checkout, too. Just like you did at registration, have volunteers waiting to help guests who are standing in line pick up their items, but haven’t paid yet. Give volunteers stickers or slips of paper that say “PAID” that guests can present at item pick-up, to retrieve what they won. 3. Use tablets for other miscellaneous tasks at your event— like selling raffle tickets, merchandise, or dinner tickets on the fly. Have a contest going on, and you want to sell entries during dinner? No need for everyone to get up in the middle of eating to go buy one. Simply equip volunteers with tablets so they can move around your ballroom and collect entries from seated guests as they go. HINT: Set up volunteers at a station to sell raffle tickets as people enter the event, then have additional volunteers in color-coded shirts or lanyards milling about so guests can stop and buy one when it’s convenient for them. We’ve been really loving how mobile bidding spreads from event to event. You just have to see it done once in person to fall in love with it—and then to want it at your own event. At mobile bidding events, guests are usually already bidding when they arrive, and registration takes half as long as it used to take. It’s magic to see people already on their phones, admiring the silent auction items, as they put a credit card on file at check-in. It simplifies a lot of traditionally annoying auction quirks—like no more crowding in the silent auction room! For a long time, we all struggled with the problem of growing audiences in small venues as events continued to attract more and more people. Then came along mobile bidding, and no more hogging bid sheets, no more camping auction items. Now guests can go get a drink and chat with their friends in the hall or ballroom, all while keeping an eye on the silent auction items they want. Bids go higher while guests are happier. But probably the biggest change we’ve seen with mobile bidding is how dramatically it changes checkout. Guests have already seen what they’ve won, thanks to their smartphones, so now they can go into the live auction and paddle raise knowing how much they can spend—without needing to ask anyone! TIP: Another great selling point, if you’re looking to adopt mobile bidding at your next event? Going green! With mobile bidding, you don’t even need to print batches of receipts at the end of the night. Simply email them out to everyone and you’re done!. Now, we’re not going to pretend like introducing a big new piece of technology to a few hundred people is not a monumental task. While the benefit is there—like raising tons more money, making event night itself much simpler—people who have always done things a certain way are often resistant to change. But don’t worry. We’ve got a whole action plan here to help you introduce tech like tablets and online bidding to your board, your volunteers, and your guests. Tell everyone what you’re doing. Send out an email to your guest list a few weeks before the event to tell them you’re shifting over to mobile bidding. Give them a brief overview of how it’ll work, and how much easier and faster it will be! Then create a page on your website about this new, amazing technology so they can check it out if they have more questions—and you have plenty of time to field those questions before the big night. Select volunteers to use tablets who are comfortable with it. The best way to avoid pitfalls with new tech? Bring in people from the outset who are excited about using it. Pick volunteers to use tablets at check-in who already have computer competency. Have bid assistants roaming around, helping people bid, who love to use tech and are good at showing others how to do it. Stay in touch. Throughout your event, use your new technology to show people why it’s so invaluable. Text them to let them know when it’s time to enter the ballroom for dinner, when the silent auction is closing, when checkout starts. Treat mobile technology as a direct link between you and your guests! It’s the perfect way to curate an interactive, seamless experience that will keep people coming back year after year.